It’s amazing what one campfire can do for you. Celebrate Robin Hood’s birthday! Because, frankly, he’ll take an outdoor adventure over a fancy to-do any day. It’s one of the reasons why I married him. We left Albuquerque a little later than planned, so it was pretty dark by the time we reached our destination. Luckily, though, we found a big, lovely campsite, and made camp. A short but sound night’s sleep later, we rousted ourselves, camo’d up, grabbed our gear, and hopped on the four-wheeler. After an exhilarating little ride — four-wheeler rides remain a thrilling novelty to me and I hope they always do — we arrived in the area where Robin Hood wanted to hunt. A note about four-wheelers: Yes, they are loud, and seemingly counterintuitive to the whole concept of hunting. However, they are extremely useful when you want to hunt a more remote area that’s not so friendly to camping, AND they can go places where a truck might not be able. Also, well…they’re fun. We traipsed around quite a bit, but no luck. We neither saw nor heard any turkeys, although we did see several deer. Seeing a deer bounding through the woods is one of my favorite sights in nature. Even when they’re doing it to escape a predator/hunter, there’s something so carefree, so jaunty, about it. I love it. Eventually, we called it a morning and headed back to camp, where we stuffed our faces — nothing like walking around the wilderness to whet the appetite! Then Robin Hood went to visit some friends we’d run into who were also turkey hunting, while the dog and I stayed behind and napped. Rain fell in periodic showers, which, if not conducive to good hunting, were at least refreshing. The evening hunt was a little more exciting — we heard a turkey! Robin Hood has a turkey call that he used, and his first call yielded an immediate gobble. We exchanged a look, exclamation points in our eyes, and hustled (quietly) to find the tom. Sadly, no dice. We heard him a couple more times, but he was always juuuust over the hill/across the valley/through the next patch of trees. And then he went silent. Oh well. Such is hunting. Contrary to movies, TV, etc., you don’t always get your quarry. We returned to camp, built a fire, and at once, the world was a better place. We cooked campfire tamales, and after dinner, our friends came over to hang out for a bit. We swapped stories from the day, batted around ideas for the next, and when the hour got late, said good-night. Well. Turns out, due to an incident involving rain and a loose tarp in the middle of the night, we opted to sleep in the next morning. We made a leisurely day of it, cooking breakfast, going for one last four-wheeler ride, packing up camp, and bidding adieu to our friends. We stopped before really hitting the road to practice some target shooting. Eventually, we started the journey home, where paved roads, plumbing, and Robin Hood’s birthday dinner waited. Here’s to lots more outdoor adventures this year! Where was that picture taken? It looks sort of like the Zunis. 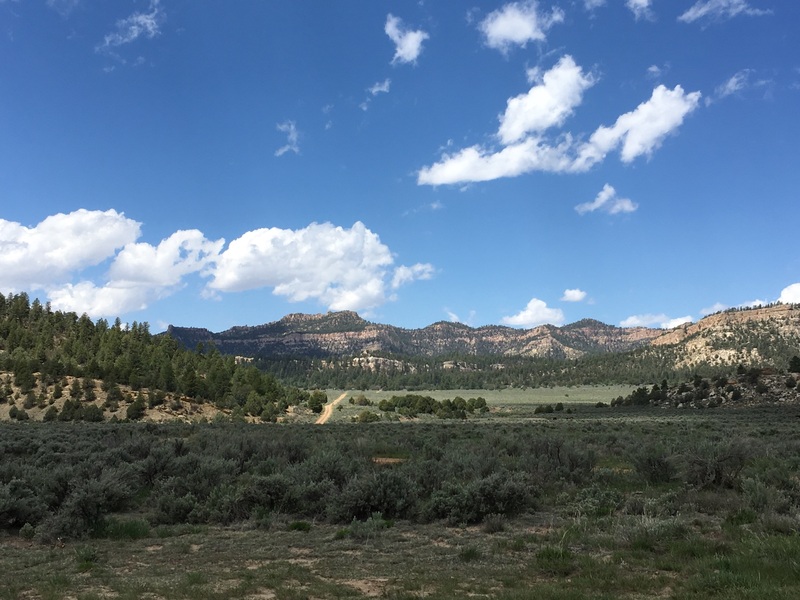 NM Game & Fish Unit 5B…near the Chama River.